It's that time of year where we start to jet off on our holidays and enjoy some time away. I'm off to New York next week, and have already started to think ahead about what I'll be packing in my carry on. Like most people, I have my go-to items that make the whole travel experience a lot easier and relaxing. The long flights, and recycled air can really take it out on your body, so it's important that you look after yourself and pack those items that'll benefit you the most. Whether it's a long or short haul flight, there are things that can give you extra comfort and make the whole experience more enjoyable. For me, the right piece of luggage and document holder saves a lot of time. I'm a big fan on the 4-wheeler suitcases as there's no need to carry your hand luggage through packed airports or have everything spill out onto the floor. Most airlines have reasonable storage space, but always check the size of the bag before you purchase. The travel document holder saves a lot of time in finding the your ticket and passport instead of rummaging around in the bottom of your bag. It's also useful in storing any other documents for your onward journey and can also be doubled up as a wallet. When you're on a long flight, skinny jeans and a button down aren't the most comfortable of attire. I often find that the cabin temperature can be a bit unpredictable, so I always carry a sweatshirt or hoodie of some sort. It makes me feel a lot more relaxed and means you have an extra item of clothing, just incase your suitcase goes missing at the other end. It's for this reason that I also pack all my technology into my carry on. You never know what holiday snaps you'll want to take whilst travelling and incase the inflight movies aren't to your taste - you can always load up your iPad or laptop with your favourite films. If you're travelling for work or are a blogger like myself, it also gives you the chance to catch up with emails or write a post or two since most long haul lights have wifi nowadays. I always find that the plane dries my skin out, so I make sure I pack a moisturiser of some sort. My new favourite is Clinique for Men, Oil Control formula. It goes on really easily and leaves my skin feeling great. I also carry a pack of skin/baby wipes just to freshen up and make sure I'm not left smelling after travelling for 16 hours. Although you can't take one through security, grab a bottle of water from duty-free to make sure you stay topped up and hydrated both on the flight and once you get to the other side. 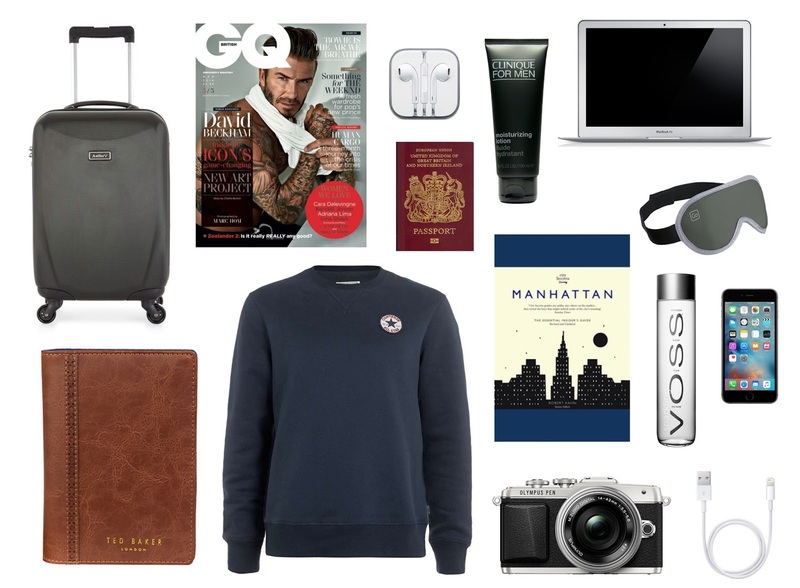 Whilst you're there, grab a copy of GQ as no guy should be without this. It has some great style articles and is a worthwhile read for the modern day gent. I'm also a fan of a guide book. It get's me excited for where I'm heading and gives me a heads up on the best places to eat and visit. 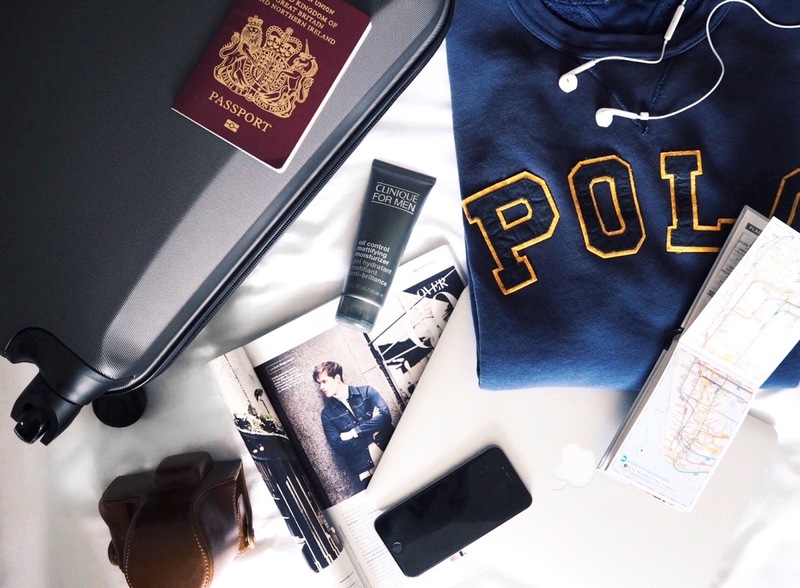 Wherever you're heading this Summer, make sure you do it in style - and don't be that person who get's to the airport and realises they've left their passport at home.